As you have no doubt seen schools are now suffering with on-going budget reductions and general funding cuts from Central Government. Deykin Avenue has decided to start a fundraising campaign with all proceeds going directly back into supporting your children's education and learning. With Christmas coming, I thought it would be a good time to tell you all that the school is registered with a fundraising website called Easyfundraising.org.uk. Asda, Tesco, Sainsbury's, Morrisons, Waitrose, Ocado, John Lewis, Argos, Marks & Spencers, Amazon, Ebay, Sports Direct, Boots, Curry's, AO.com, trainline.com, Expedia, AA, RAC, Aviva, Sky, Virgin Media, B&Q, Next, PC World, Apple, Groupon, Ticketmaster, BT, Just Eat, EE, Plusnet, Vodafone, Debenhams, JD Sports, British Gas. and click on the "Join us" button under our school logo. You will then need to fill in the registration form and submit it. You will then be registered as an official supporter of Deykin Avenue JI School. 1) Login to www.easyfundraising.org.uk and click in the "Search for retailers" bar at the top of the page. Type in the retailer you want to purchase from and click the magnifying glass. You will then see the name and logo of the retailer and what percentage they are willing to donate. You then simply click the "Go shopping and raise funds" button. This will redirect you to the retailers website and you shop as normal, except from that point any purchase made will trigger a donation from that retailer to school. 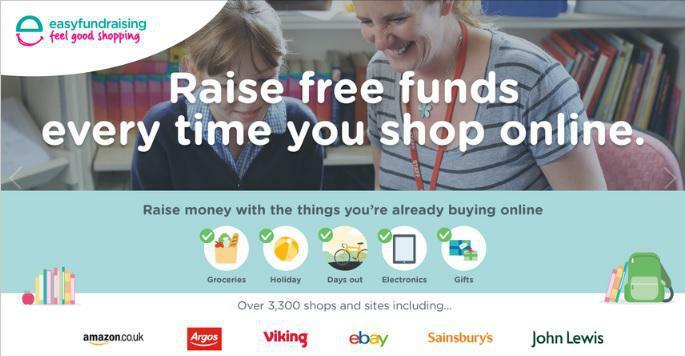 This toolbar will then install to your internet browser (Internet Explorer, Mozilla Firefox, Google Chrome, Safari) and when you visit a retailer that is registered with Easyfundraising.org.uk a notification will appear and ask you whether you want to activate donations from that retailer. Once you click "Activate Donation" any purchases made from that retailer will automatically trigger a donation to our school. There is also a mobile phone and tablet app for iPhone, iPad, and Android. It doesn't have to just be parents that can raise money, extended family and friends can help raise money too! Please feel free to share our Easyfundraising link and help us to raise money to help support your children's education and learning.